Mangez Avec Moi Express is a small, carry-out establishment neighboring it’s main sit-down restaurant. Specializing in Vietnamese bahn mi, I recently grabbed a sandwich for dinner on the way home from work. How did it turn out? I was a bit wary at first; the guy preparing my sandwich was decidedly not Vietnamese. However, I kept an open mind, ordering a spicy “traditional” bahn mi – a French baguette with cilantro, pate Vietnamese ham, vegetables, peppers and a sweet sauce. After taking the quick picture above, I dug in. Although the sandwich got a little crushed in my bag, the baguette was nicely toasted, and the vegetables were fresh. For $6-7, the bahn mi provided a filling and scrumptious dinner meal. I wouldn’t say that it was the best bahn mi I’ve ever had, but I won’t turn my nose up at this one. What’s your favorite type of sandwich? mmm. i love bahn mi, though your price shocks me a little! I've never seen them over $5. haha. i usually get the grilled pork kind, and i love it when there's lots of pickled carrot/daikon! yay Vietnamese, that's my people's food. I hope this doesn't make you sad but over in California, banh mi costs $2.50. About 10 years ago, it only cost $1. I love the pate and the special mayonnaise they have. I've never had Vietnamese but that looks tasty! This place is a few blocks away from my old office and I used to go there a lot (crappy food options around there). Anyway, I thought it was fine as well. It's a nice take out option to have in that neighborhood. 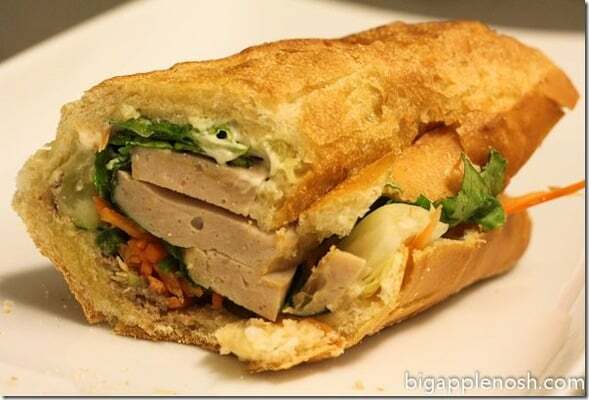 Mmmm….I love vietnamese sandwiches!! So good. I've only had them tofu and they were delicious. Aahh bahn mi are among my favorite foods ever – so fresh and delish! Thanks for this review! OMG OMG OMG OMG. I grew up on these and LOVE them. I also love how they've grown in popularity. There's a banh mi truck in our area that's super hipster and makes it totally mentally accessible (not that it's necessary). Is that ham or the pork sausage they call, cha lua? Darn you, it's after midnight and now I want one!! !